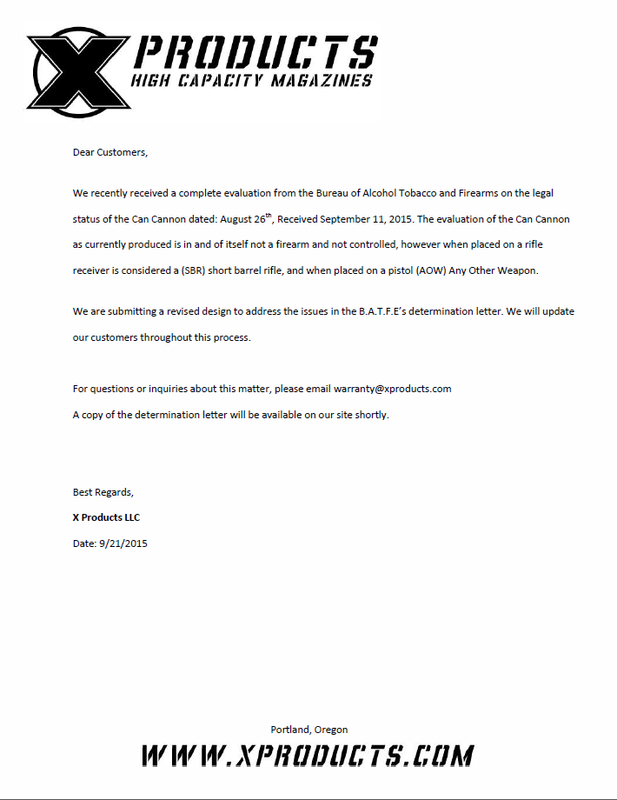 Fresh from the X Products LLC Facebook page is a notice from the company about the BATFE’s determination letter regarding the classification of their “Can Cannon” product. The letter indicates that the BATFE has evaluated the product and determined that, by itself, the product – essentially an AR-type upper receiver with a big tube for a barrel – is not a firearm. However, when the user mounts the Can Cannon onto a lower receiver, he has created a short barreled rifle (SBR) if the lower is a rifle receiver or an “any other weapon” (AOW) if the lower is a pistol receiver. 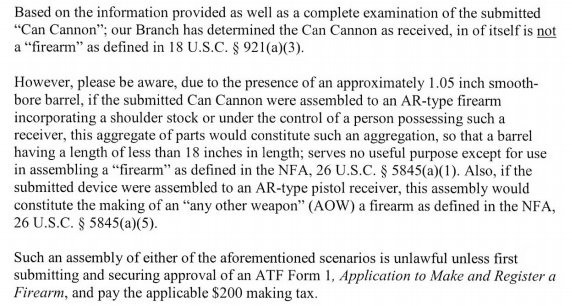 The company’s letter states that they are in the process of finding a redesign that will not result in the creation of an SBR or AOW when the Can Cannon is mounted. Until the fix is finished and approved, however, Can Cannon owners should be aware that assembling the product onto a lower receiver will result in a Title II firearm that is governed by the rules of the National Firearms Act (NFA) and, without the proper making/transfer/registration paperwork, can result in the potential for hefty monetary fines and prison time. This determination is not the end of the world, however. Aside from the X Products redesign, users are also able to just go with it and use this as an opportunity to start down the costly road of NFA ownership. Although the extra wait (months) and expense ($200) may not appeal to everyone, owning NFA firearms is easier than most people might expect. I suspect that what is needed here would simply be an ATF Form 1 Application to Make and Register a Firearm for the appropriate item (SBR or AOW) that you wish to create. Perhaps Team GunLink may be in the hunt for a cheap Can Cannon when the market gets flooded by owners who do not want to bother with the additional work. 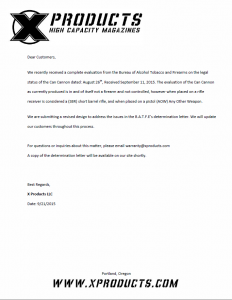 X Products has now posted a copy of the BATFE determination letter describing the above findings. Read the full letter (PDF) by clicking the excerpt below.